Hi everybody! Just wanted to share a really cute picture of Holland and Eden hanging out on the couch at home... They had a pediatrician appointment on Wednesday. Holland weighs 7#, and Eden weighs 7#10oz. They've done another switcheroo on us, and Holland has been eating like a champ! Eden has been having a little more trouble. She has started to get really crabby in the middle of eating and doesn't want to finish her bottles. Just normal baby tummy troubles, we suspect, and we've been troubleshooting trying to figure out how to help her. She went one full week last week without gaining any weight, but gained 6 ounces last week. We're hoping it's just a phase and it won't last long. Fortunately, she continues to be really mellow and happy between feedings. Holland has been eating more than Eden recently and has a good time while doing it. With her, we have more trouble with the sleeping thing... She sleeps great during the day, but has been awake and kinda crabby the past couple of nights. Oh, the joys of parenting twins!!! 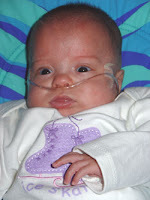 Holland weighed 6 pounds 6.5 ounces at her last checkup. She stores all her fat in her chipmunk cheeks and big round belly, but still has skinny legs and a tiny bottom. She's a really spunky gal with a lot of energy. We have many nicknames for her, including squeakerbox and LJ (little John) because she is always making squeaky noises, and has eyes exactly like her daddy. Holland's bright eyes always appears really animated. She, like her sis, likes to cuddle with mom and dad and is really sweet. She tends to fuss a bit more, and it takes more trial and error to figure out what she wants. Both girls are pretty good-natured, but I must admit that I am NOT supermom and there are nights when I'm so tired and cranky that Holly and I both just sit and cry! The girls have been home for 2 weeks now, and boy are they growing fast. We had a pediatrician appointment today and Holland weighed 5 pounds 13 ounces, and Eden 6 pounds 9.5 ounces. 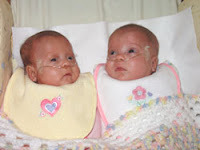 They have each gained over a pound since leaving the hospital! Our lives now are busy, busy, busy, and without much sleep. The babies are on a good schedule, but they never sleep for more than a three hour stretch. It was okay at first, but that kind of sleeping schedule really catches up with you. When they wake up at 4am, it takes over an hour for us to warm up bottles, feed and burb the babies, pump, and clean up, so I don't get back to sleep until around 5:15, only to wake up again around 7:45am. I guess that's the life of a mommy. But on top of all that normal baby/twin stuff, we are also dealing with 2-3 doctors appointments a week, medicine schedules, and all kinds of equipment and alarms. 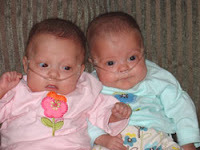 It is more than worth it when I look into their sweet faces and remember how far they have come. I wouldn't trade it for anything!